Crystal clear containers for drosophila or other insects. 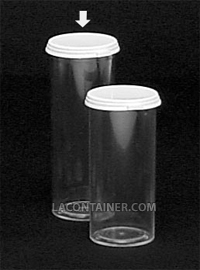 Our polystyrene containers are perfect for collecting and growing drosophila or other insects. The glass-like qualities of these vials make it ideal for lab observation of many specimen samples. The only drawback is that polystyrene is not autoclavable. The straight wall design of the vials does make it easy to apply labels. 28.6mm Dia. X 82.6mm Ht. 1 1/8" Dia. X 3 1/4" Ht.